The number of actively connected seniors continues to rise, even while their connection rate has stalled. Also, seniors are very active with their connected devices, from PCs to Tablets and Smartphones. There are more American seniors online than ever before. This is primarily due to two factors – rapid mobile phone adoption and the growing number of seniors in the U.S. Population. Based on our Technology User Profile (TUP) 2017 survey, nearly 44 million adults age 62 and older actively using a PC, Tablet, Mobile Phone, or Game Console to connect to the Internet. A market segment often overlooked or derided by the tech industry, seniors have been increasingly embracing technology, weaving it into the fabric of their lives. Mobile phones are hot among older adults, especially Smartphones. Tablet and Smartphone usage has soared among Americans age 62 and above, rising 49% and 47% per year, respectively, between 2013 to 2017. In 2013, the number of active Tablet users age 62 and over was under 4 million, and in 2017 that number is 19.1 million seniors. Similarly, Smartphone use has grown from less than 6 million adults age 62 and over in 2013 to 26.8 million in 2017. Notebook PC use has also grown, while overall PC use has remained essentially flat. Mobile PC use has grown 20.4% per year from 2013 to 2017. Use of at least one PC has increased 1.8% per year from 2013 to 2017. Getting connected has outpaced population growth. Only a small part of these growth rates is due to the growing population of seniors. The US Census projected that the number of Americans age 65 and above grew 3.3% per year from 2013 to 2016. During this same period, the number of Connected Adults age 65 and above grew 5.6% per year. The current number of 43.4 million adults regularly using an Internet-connected PC, Tablet, Mobile Phone, or Game Console is up from 35.7 million in 2013. In other words, one in five (20%) Connected Adults in the US are age 62 and above. The rapid growth of Smartphone use among seniors is due in part to the many of these adults who have given up their old data-free basic cell phones. However, that’s not the entire story. Overall mobile phone adoption has grown. Between 2013 to 2017, mobile phones are in the hands of 20.5 million more adults age 62 or above. Seniors are big tech spenders. The average annual household technology spending by adults 62 and older is $6.6k. Among slightly older adults 65 and older, the average is slightly less at $6.5k per year for all technology devices and services. Like their younger counterparts, the majority of tech spending by older adults is for services, from cable TV and smartphone service to Internet connections. Often seniors are overlooked with the uninformed belief that they are not active with their connected devices, or only focused on healthcare. Although not as active as younger connected adults, seniors are busy with their connected devices. More than 50% of connected adults age 62 and older around the world use their primary connected device for nearly every type of activity: from Communication, Shopping, Information & Search, and Personal/Productivity, to Entertainment. One reason that seniors may be thought to be less active is their relatively lower presence on Social Networks, making them less visible. This is based on our Technology User Profile 2017 survey across five countries (US, Germany, India, UK, and China). In China and India, connected seniors 62 and older. Searching online for healthcare information is a major activity for half of seniors using their primary connected device, although it’s the fifth-ranked activity. Even more widespread are activities such as shopping, staying in touch, on top of finances, and current events. I expect connected seniors to continue to expand their use of their technology, while unconnected seniors will remain unconnected. Those already connected will follow the path of younger adults and these senior’s younger selves, finding evermore ways to enjoy and utilize each type of technology they’ve adopted. Among unconnected seniors, the flattened connection rates isn’t likely to spike soon with the current approaches. Although many organizations from retailers to hospitals are nearly demanding that all their clients all interact online, force isn’t working. Unconnected adults are not being served, or organizations are needing to rely on connecting through traditional methods: postal mail, landline phones, and personal visits. Senior non-users are unlikely to respond to the benefits that attracted younger adults online in the first place. Instead, new approaches are needed. In the meantime, don’t be surprised to see more active seniors toting Smartphones and Tablets. The information in this TUPdate is based on the most recent wave of Technology User Profile (TUP) – the TUP 2017 wave into the US, UK, Germany, India, and China. Current TUP subscribers can tap into these and additional similar results about seniors and younger adults. For more information about MetaFacts and subscribing to TUP, please contact MetaFacts. Despite the on-the-go lifestyle of the technology consumer, there’s still a sense that “home is where the heart is.” It seems that home and work desktop PCs, while no longer the only option, still have a place in the tech-race. As mobile devices develop more PC-like qualities, and as desktops grow out of clunkerhood, each spurs the other on to top the market. To what extent have Dell and Lexmark penetrated the printer market? Which segments have they penetrated? What is Hewlett Packard’s share among Dell computer owners and Dell or Lexmark printer owners and has this changed? Are Rental PCs a Clue to the Next Big Thing in Technology? 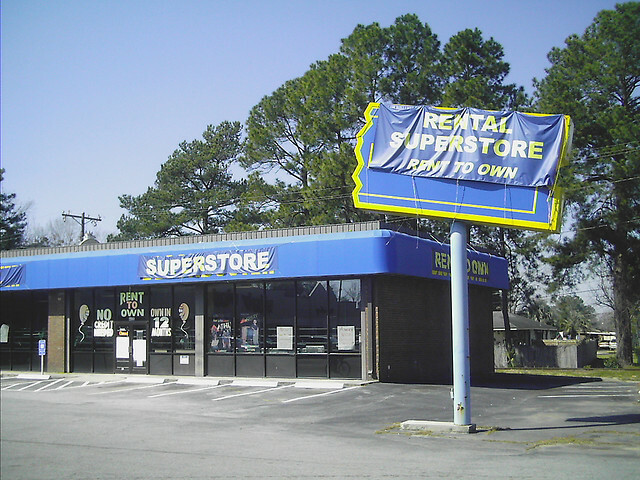 Rent to Own-Storefront look familiar? Consumers continue to shape the future of technology with their pocketbooks, whether by outright purchase or payment plans. PC renting is not currently widespread among most U.S. consumers, with only 1% of American online adults using a rented home PC. If considered much at all by the digerati, it is considered passé or fringe. However, looking ahead, consumer usage patterns are trending towards the pay-as-you-go or the ad-supported model, and with a new definition of PCs and devices as the preferred platform(s): whether called Smartphone, Laptop, Tablet, Netbook, Mobile, or otherwise. Today’s PC rental business might be called opportunistic, socially beneficial, or predatory, depending on your perspective. Americans renting PCs skew towards younger adults – particularly those PC Newbies who have used a PC less than a quarter of their life – as well as skewing towards adults not employed full-time. Also, evidently, PC renting is biased towards people of color: with rental rates higher among adults who identify with a racial/ethnic group other than White/Non-Hispanic. Interestingly, these same segments are stronger than average in their use of Smartphones or Basic Mobile Phones as their primary or only browsing, email, and Twitter platforms, as well as the broadening use of prepaid cellular plans. This signals that these consumer segments are likely the earliest adopters of new financial models – not the mythical early adopters stereotypically portrayed as affluent, highly-educated youngsters. Recently, attention on the rental PC business has increased due to the controversial practices of some rental retailers. The major furniture rental chain Aaron’s was named in a federal lawsuit. Some rental companies, allegedly including some Aaron’s outlets or franchisees, have protected their equipment through the use of remotely activated webcams or tracking software, to the consternation of unwitting renters. Privacy and security issues are looming as important factors following large breaches spanning credit cards, health records, Sony PlayStations, passwords and WikiLeaks documents, only to name a few. The pay-as-you-go approach has done well for the cable TV and wireless phone businesses, if not for PC manufacturers or PDA makers. Wireless carrier subsidies are increasingly driving the decisions of consumer technology manufacturers, a factor arguably contributing to Palm being driven from their business model prior to being acquired by Hewlett Packard. In addition to this pay-now/pay-later balance, consumers also position platforms along the BOB-Integrated spectrum. The BOB – Best Of Breed – end of the spectrum features products which do one or few functions very well. One example is a standalone GPS device which gives directions extremely well. The other end of the spectrum: Integrated or Swiss Army Knife – features broadly functional devices which do many things adequately. An example is a Smartphone navigation app, which may not have a full function set or may be compromised due to simultaneous use for incoming messages and music or as a timepiece. Most interestingly, consumers find ways to adapt their behavior in ways that are out of synch with the intentions of the product designers, in some cases using on a fraction of a product’s capability while at other times finding new uses for products beyond their expected design. Looking ahead, MetaFacts expects continued turmoil and changes as each segment of consumers decide their own favorite device or platform striking a balance of BOB vs. integrated, with choices being affected in part by heightened security and privacy concerns and in part by the underlying payment model.